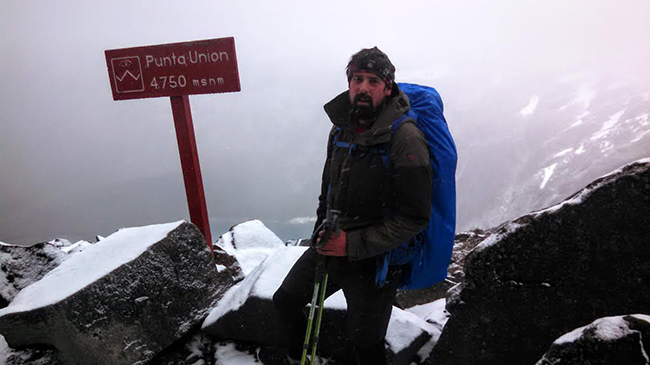 Explorer and Bloomington native Michael Water on his October 2014 hike through the Andes Mountains. Courtesy photo. When you click on Bloomington native Michael Waterford’s bio at waterfordexplores.com, you get a pretty good snapshot of who he is: adventurer, philanthropist, expedition manager, gear expert, outfitter, backpacker, traveler, a climber who has summited mountains on six continents. Between 2008 and 2012, Waterford lived and worked in 43 different countries and four U.S. states. His travels have raised more than $10,000 for charities and nonprofit organizations. Right now, Waterford is on a more local expedition, exploring five Indiana land trust territories, plus numerous national forests, state parks, and recreational areas. The hiking trip, from December 1 through December 17, started in Hutsonville, Illinois, just outside Indiana. The first stop: Greene-Sullivan State Forest. Waterford will be posting updates on his journey, and we’ll be posting photo updates and tracking his progress here. Check back frequently for updates and photos. Click here for his current location. To learn more about the trip and his gear, click here. To donate to Sycamore Land Trust, visit this page.